Country singer Kenny Chesney continued his "No Shoes Nation" tour Last night at Sports Authority Field at Mile High with a special appearance from a notable Denver resident. Denver Broncos quarterback Peyton Manning came on stage to participate in Chesney's "Boys of Fall" spot, as he did at last year's concert at SAF@MH. Chesney's summer tour includes stops at seventeen different stadiums and kicked off in March at Raymond James Stadium in Tampa, Florida. 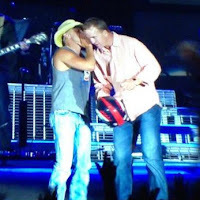 Last year, approximately 52,000 fans were in attendance at Chesney's Denver concert. This year's edition drew another large crowd. Manning took the time to sign a helmet and give it to a young fan, per Nashville Becca. Chesney's popular "Boys of Fall" music video can be seen after the jump. Manning's appearance was apparently well-received by the male fans in attendance. when peyton manning came on stage, i'd never seen so many guys screaming and fangirling at once. it was somewhat terrifying, but hilarious. Not surprisingly, Manning's presence was well-received all around. Chesney, of course, is a buddy of Manning's and the duo share Tennessee connections (Chesney was born there and Manning played at the University of Tennessee). Peyton Manning came out when Kenny Chesney played Boys Of Fall Tonight. They bro'd out so hard that I almost cried. Kristen Nelson was just one of many who tweeted near-heart attack experiences from the night. As I'm leaving the show tonight, I walk past a fenced off area for VIP's and I see Peyton Manning. Nearly had a heart attack. From the looks of those tweets, it sounds like it was a successful night. There have been no reports of major field damage from the concert, although that was a concern. The Broncos will hold a team scrimmage at the stadium on Saturday, August 3, which will be free and open to the public. It will mark the first time this year that the team practices in-stadium in preparation for the 2013 season.